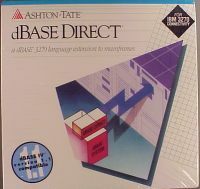 This document lists brief descriptions of dBASE versions, along with notes and a brief list of features. While you may find older versions of development tools in many places, links to the old/used programming tools sales pages of EMS Professional Software, this page's sponsor, are provided for your convenience. EMS is not affiliated with Borland or Inprise, or any other vendor. 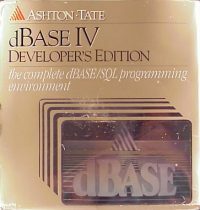 All terms on this page are trademarks of dBASE Inc. or other companies. Other Borland tools. Software from other vendors. If you have technical questions, we recommend asking on the news:comp.databases.xbase and news:comp.databases.visual-dbase usenet newsgroups. 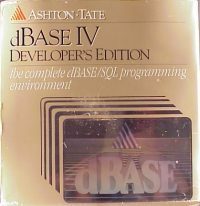 dBASE III+ in slipcase. 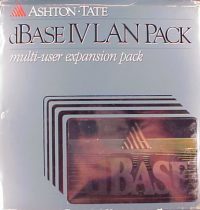 Same packaging was used with Ashton Tate 1.0 and 1.1 versions. 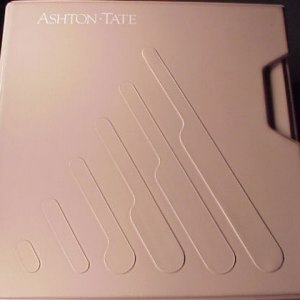 After Borland bought Ashton Tate, the packaging changed. 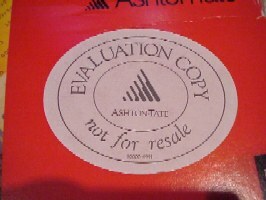 First packaging after Borland bought Ashton Tate. Box sleeve rear lower right labeled 10160-0850. 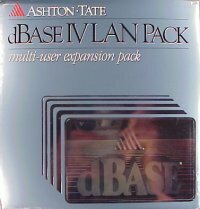 Multi-User - This package supports both single and multi-user operation of dBASE IV. Multi-user mode also supports diskless workstations. Includes fourteen 360K diskettes with serial number (needed for installation) on System Disk 1. 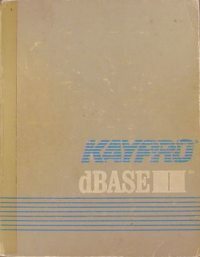 Large vinyl covered slipcase, bottom labeled "dBASE IV, PART NO: 10167-9100, VERSION 1.0 UPGRADE"
dBASE IV Language Reference, 3 ring binder, outside rear labeled 10160-0630, rear of final page cover 10160-0280. This is a computer manual system only. No software is included. 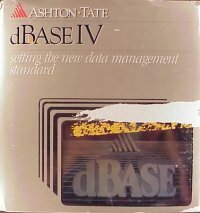 Adds five additional users to existing dBASE III+ 1.1 and dBASE IV installations. 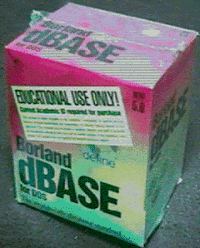 Includes a dBASE Access Disk and enhanced network installation documentation. There are two differently dated varieties of diskettes. The original version is dated 07/17/90 12:00. The "B" version is dated 4/19/91 12:00. Box rear lower right labeled 10160-0851. 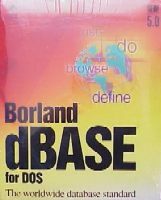 Supports specific versions of Novell NetWare/286 and 386, 3COM 3+, IBM PC LAN (including Token Ring), and compatible networks. 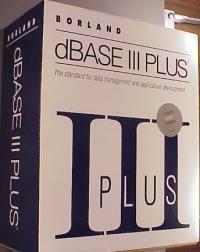 Upward compatible from dBASE III Plus allowing current files and most applications to be used without modification. 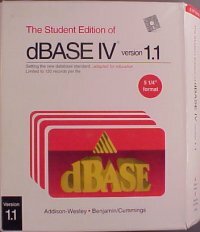 Multiple users can share a single copy of dBASE IV using dBASE IV LAN Pack. 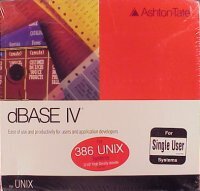 Adds 315 new or enhanced commands and functions to dBASE III Plus set. 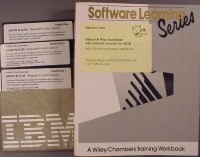 Includes ten 360K or five 720K floppy disks with serial number (needed for installation) on System Disk 1. 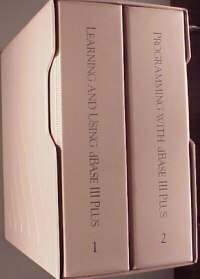 Manuals in vinyl covered cardboard slipcase with white label "dBASE IV, PN: 10160-9101, SN:999999999-99, Version 1.1"
dBASE IV 1.1 for UNIX -©1990, Minimum 4MB of internal memory. Performance will improve considerably with 8MB or more of memory. For any 100% compatible Intel 386 based PC. Operating system: Most 386 UNIX operating systems including SCO XENIX version 2.3, SCO UNIX System V/386 version 3.2, and Interactive 386/ix version 2.0.
dBASE IV 1.1 for UNIX RunTime -©1990, For Sun-3, Sun386i, Sun-4, SPARCstation and SPARCserver running SunOS 4.0. For PCs running most 386 UNIX OSes including SCO XENIX 2.3, SCO UNIX System V/386 version 3.2 and Interactive 386/ix version 2.0. Registration card, ADB1 BOR 3541. 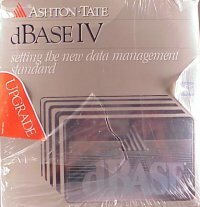 Same card can be used to register dBASE IV, dBASE IV RunTime, dBASE IV LAN Pack (1 or 10 count). 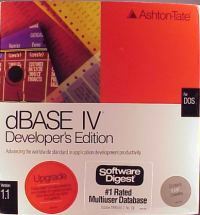 dBase IV 1.5, Runtime, 3.5" and 5.25"
System Requirements: An Intel 286 or higher based PC. 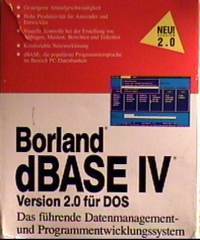 DOS 3.3 or later and 1MB extended RAM (Supports up to 16MB RAM). Minimum of 3.5MB hard disk space. 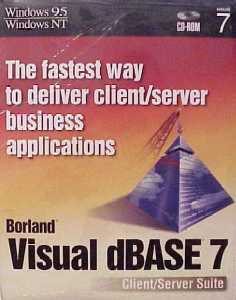 Works with DOS and Microsoft Windows 3.0 or later or IBM OS/2. 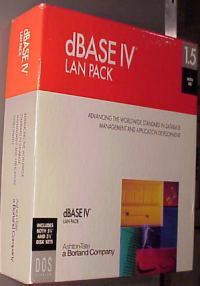 Networks supported: Novell NetWare v2.2 and 3.11; 3Com 3+ Share v1.60 and 3Com 3+ Openv2.0 ; Lantastic v4.1; Banyan VINES v5.0; MS LAN Manager v2.1; IBM LAN Server v3.0; AT&T StarGROUP V3.6; 100% Compatibles. 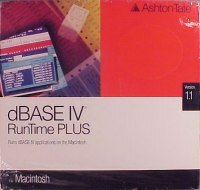 Up to 10 times faster than dBASE IV 1.5 and dBASE III Plus. At introduction, was $795 new and $100 for upgrade from dBASE or LAN Pack. 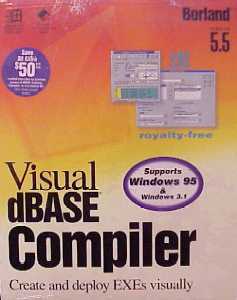 dBASE Compiler v2.0 for DOS. Applications compiler with 2.0 run twice as fast as those produced with dBASE Compiler 1.0. IT was available as an upgrade from 1.0 for $99.95 and at an introductory price of $199.95 for everyone. No license, royalty, or runtime fees, and no LAN keys. Academic version markings. Full version markings. 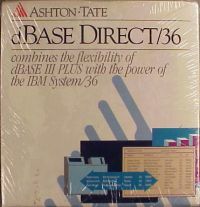 Brown direct box, white label reads "DOS, dBASE Compiler, Includes 5.25" HD Disks, Item: DBC1020WWFN550, Version 1.0"
dBASE for Windows Special Upgrade. 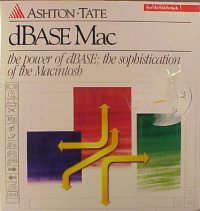 No hard disk search, but licensed for current owners of dBASE III Plus, dBASE IV, Paradox for Windows and Paradox for DOS. 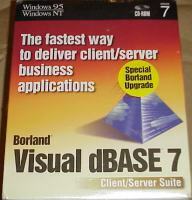 Visual dBASE 5.5 for Windows Special Upgrade - No disk scan during installation, but you must own any version of dBASE, Paradox, Office Suites, Access, Approach, DataEase, FoxPro, Clipper, Arago, or Superbase to qualify for this license. 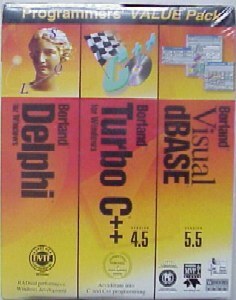 Label on bottom of box reads: "Visual dBASE CHAN UP"
Visual dBASE 5.5 - Minimum system requirements: 386 or better processor, Windows 3.1, Win95 or later, 6MB memory (8+ recommended), 10MB disk space, VGA display. 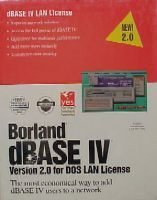 Supports networks: NetWare 3.11+, Personal NetWare, Windows for WorkGroups3.11, Banyan Vines 5+, IBM LAN Server, MS LAN Manager 2.1, Lantastic 6.0. 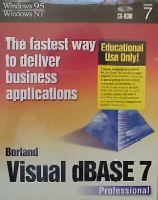 Visual dBASE 5.5 Professional - Includes a compiler so you can deploy your applications to other users royalty-free. Also intranet tools. 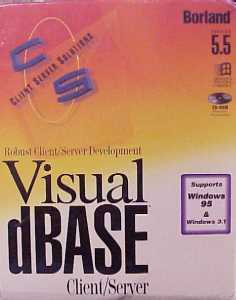 Visual dBASE 5.5 Client/Server - Includes Visual dBASE 5.5, Visual dBASE 5.5 Compiler, Local InterBase Server, native SQL drivers to connect to popular database, plus a DataPump Expert. or Office, Clipper, Visual Objects, or Corel Office Suite. System requirements:486DX2 or higher processor, Windows 95/NT 4.0 or later, 12MB (Win95)/16MB (NT) RAM. 31MB disk space. Current Academic ID required for purchase. This software…may not be resold outside the academic community. 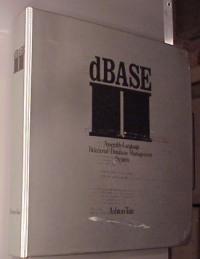 Connectivity facility for interrogating, manipulating, and reporting System/36 files simply and quickly through dBASE III+. Lets you access fields, records or files on a System/36 for queries and reports, or lets you transparently bring the data from the System/36 - converted into .dbf format - for use with any dBASE III+ application. Borland is a trademark of Borland International. All other products mentioned may be registered trademarks or trademarks of their respective companies. The information offered in this site is provided without warranty or guarantee for suitability of purpose. Any information or advice is provided in good faith as being correct, but EMS cannot be held responsible for the circumstances and consequences of use.